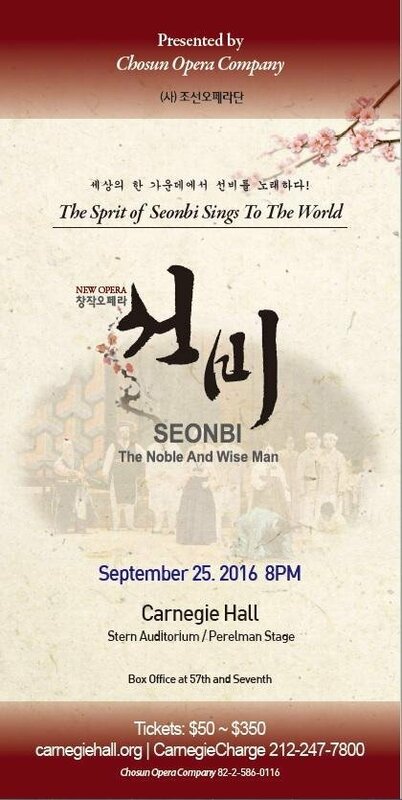 Chosun Opera Company’s “Seonbi: The Noble and Wise Man” opera is gearing up for its New York premiere, slated to take place at Carnegie Hall next month. The upcoming performance will mark the first-ever Korean opera to be staged at the prestigious concert venue. The new Korean love opera first premiered last year at the Korea Opera Festival and has since been considered the country’s best modern opera. The production has already received a number of prestigious honors including winning the grand prix award at the Korea Opera Awards last year and being named the best opera by the New Korean Opera Festival. It is also being performed by the nation’s top opera singers. Seonbi is the Korean term for ancient scholar. The opera is a tale of love and human nature that attempts to convey the message that true eternal happiness comes from a righteous spirit, not material wealth. The opera will be directed by decorated local soprano Kim Hak-nam, who previously starred as the mezzo-soprano in the Teatro alla Scala Theatre’s production of “Madama Butterfly” in Milan, Italy. The Carnegie Hall’s staging of “Seonbi” will star Kim Eui-jin, Jung Hyo-jae, Cho Hyung-sik and baritone Lim Seong-gyu. The Chosun Opera Company was founded by tenor Lee In-seon in 1948. The company is Korea’s first private opera company and was the first to gain the right to premiere Giuseppe Verdi’s “La Traviata” in Korea. It was also the first to perform “Carmen” for the local audience. “Seonbi” will be performed on Sept. 25 at 8 p.m. at the 2,800-seat Isaac Stern Auditorium’s Perelman Stage. Ticket prices range from $25 to $350 and can be purchased online at carnegiehall.org.